I’ve always dreamed of seeing the Eiffel Tower in person. Something about those big city landmarks speak to me and I’ve been lucky enough to live by three of the best-NYC’s Flatiron Building, Seattle’s Space Needle and Shanghai’s Pearl Tower. On the way to Lisbon today, we got to live my dream and turned a long layover into an adventure in Paris. “Think Amazing Race!” I told Thom as we raced through Charles De Gaulle airport. We had limited hours to navigate through CDG airport in Paris, go through customs, find the RER train and make it to the city with enough time to explore. Customs was a breeze as the French don’t chit chat like the engaging Brits who want to know every last detail of your trip. Our security guy didn’t even say hello, which I was perfectly fine with as the line moved quickly indeed with no pleasantries unlike at Heathrow where chattiness caused 90 minute delays in processing. Following the signs through the huge airport, we made one wrong turn that required retracing of steps (good for the Fitbit!) and sorting out which platform to aim for after a serious wait in line at the ticket machine. Not cheap-20 euros each for a round trip to/from city, but riding the train allows for a glimpse into Paris not found gazing from a bus or taxi. Behaving more like a locale got us into the city (with only one transfer required) in about an hour. Not bad! As we got off at the Eiffel stop, we ran up the stairs and looked around the leafy streets but no Tower in sight. Where in the world is the Eiffel Tower??? Crossing the street to the River Sienne, we looked up and to our right and THERE IT WAS looming over us and only a block away. The Eiffel Tower in all its glory was just gorgeous. Did I mention there wasn’t a cloud in the bright blue sky? With no time to go up or even walk all the way around it, we walked into a park next to the Tower where school groups played next to heavily armed guards patrolling to keep us safe. After taking many photos, we found the nearest facilities (pay to pee here too just like London so have .50 euros handy) and then we took off walking by the river. What a glorious day! The wide paths easily accommodate both bikers, joggers and strollers. The plentiful bridges and boats on the river add ambience galore. While there were many cafes along the path, they had just opened for the day and weren’t busy yet. I can only imagine how beautiful it is at night to walk along the river and see the historic buildings lit up. Another time perhaps. Paris, like Seattle and London, has a huge ferris wheel by the river to entice tourists. Like no other city I’ve been to before, though, stalls line the river path, selling vintage books, newspapers and magazines. Oh how I wish we had time to sit in a café, sip espresso, eat pastries and read a good book. Heaven. But time was wasting and Portugal was waiting. 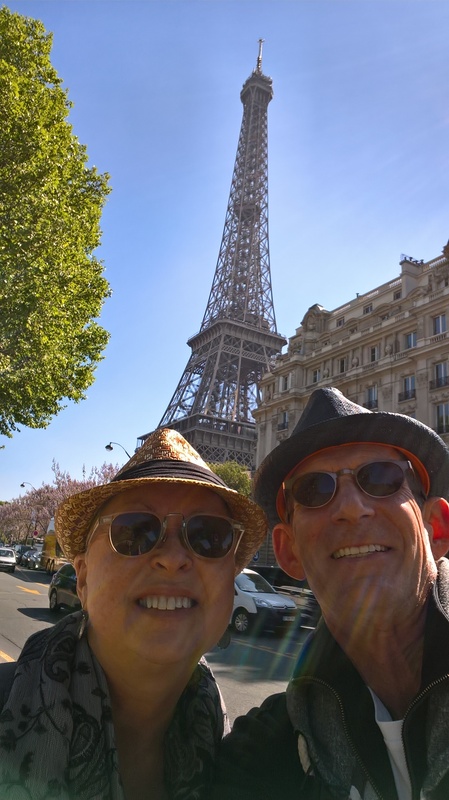 So, 5 miles and 2 hours later, we had walked along the river from the Eiffel Tower to Notre Dame Cathedral and, as luck would have it, caught the express train to the airport so we made our flight with a little time to spare. We promised each other that we would come back to Paris and explore the narrow alleys filled with quaint cafes. Soon.